While griping about airlines may be at an all-time high, people are actually pretty happy with them overall. That in part has to do with all those flash sales, cheaper options that let you customize your flight, and economy fares. Economy fares were a great innovation, but things that good can't be that good for long. Starting on Friday, United Airlines will charge extra for some economy seats that come with no extra perks. The new category of "preferred seating" is being introduced, which CNBC reports comes with neither extra legroom nor a glorious ceremonial robe. 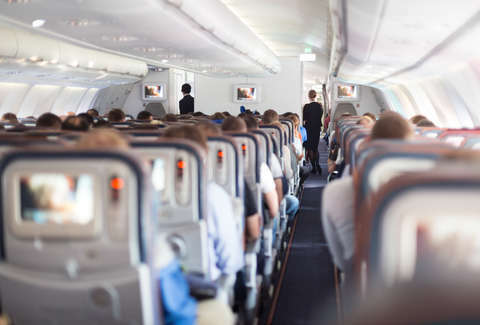 They're just the economy seats located behind the Economy Plus section, which means you'll get to leave the aircraft approximately 90 seconds sooner while deplaning. There are no details on how much more these will cost yet. In the airline's defense, United isn't alone in this. American and Delta both recently started charging for preferred seats. CNBC points out that prices for those vary a lot between the plane, route, and demand, but on one representative Delta flight, it resulted in an $80 price difference. While we're mentioning bad things, the airline also announced that it's retooling basic economy service on several trans-Atlantic routes. On those, basic economy passengers will only be permitted a single carry-on bag and will be paying for any checked luggage. It's also worth noting, though, that starting Tuesday, basic economy tickets will apply toward elite status in the United MileagePlus frequent flyer program. Flying basic economy, you'll earn 50% of the qualifying miles and half of a qualifying segment for each flight, with the price of the ticket fully applied. So if you try to make the most of your miles, there is some good news. One solution is not selecting those pricier seats, but the more traditional route would be to just gripe about it.